Woonsocket, April 1 – Dakotaland Federal Credit Union recently honored eight area youth with $8,000 in college scholarships for the 2015-16 school year. Each recipient completed a written application and submitted goals for their financial future, which was judged by a scholarship committee made up of 10 individuals. 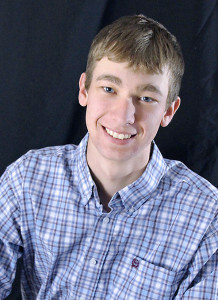 Jonathan Linke of Woonsocket was awarded one of the $1,000 scholarships. He will graduate from Woonsocket High School and will be attending South Dakota State University in Brookings, majoring in agronomy/animal science. “The Credit Union was pleased to increase the number of scholarships awarded to our youth members in 2015. We are very proud of these students and the goals they have set for themselves. It is our intent to assist them in these future ambitions any way we can,” added Credit Union President, Dan Cumbee. Dakotaland Federal Credit Union has locations in Huron, Volga, Brookings, Madison, Redfield, DeSmet, Mitchell and Woonsocket. With 28,000 members and $270 million in assets, Dakotaland continues to be locally owned and operated offering a full-line of financial services to its membership since 1935. This three-quarter scale Concord stagecoach built by Hansen Wheel & Wagon Shop for Fuji Safari Park in Japan is pictured alongside one of their full-size stagecoaches. The stagecoach was to leave the wagon shop near Letcher on Wednesday for a 30-day journey to Japan. Hansen Wheel and Wagon dominates a niche market in this country, building authentic vehicles of the American Old West, and is now deepening their footprint overseas, as well. The wagon shop, which has been building stagecoaches, chuckwagons, covered wagons and other Old West vehicles for 36 years, loaded up a three-quarter-sized stagecoach into a shipping container to be sent to Japan this past Wednesday. The coach will go to Fuji Safari Park in Japan near Susono City, Shizuoka Prefecture and close to Mt. Fuji. The park has an Old West area and they ordered the vehicle to be built pony-sized for children’s rides. Four miniature ponies will pull children in the stagecoach around a trail in their park. The park didn’t want to settle for a fake replica stagecoach; they wanted the real thing, so with a reputation for quality and authentic craftsmanship, Hansen Wheel and Wagon was commissioned for the job. This was the first scaled-down version of a stagecoach created by the shop, which involved many different considerations in the planning and construction. The stagecoach took about a year to complete. This isn’t the first such creation to be shipped overseas; the very first was sent to a museum in Denmark 20 years ago. Now the shop in rural Letcher ships around six vehicles overseas each year. An ocean-going container was sent to the shop, in which the stagecoach would be secured for its more than 5,000 mile trip to Japan. The container was scheduled to leave the shop for a port on the West Coast on Wednesday. The total journey will take 30 days. 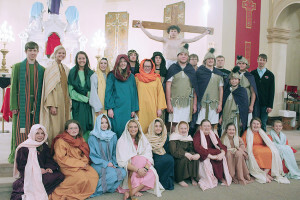 The St. Wilfrid’s High School Youth Group presented a very moving presentation of the Living Stations, an enactment of the 14 occurrences experienced by Christ on His way to the crucifixion, last Wednesday during Holy Week. Pictured above are: Trey Weber (on the cross as Jesus); standing: Aaron Linke (Simon), Tristan Ziebart, Callie Bezpaletz, Alissa Ball and Alecia Jackson (weeping women), Tate Ziebart (Pilate), Ashleigh Fry (Veronica), Austin Ball (assistant to Pilate), Shay Swenson (guard), Ty Ziebart (lights), Jacob Fouberg (guard), Devon Weber (lights), Nathan Linke and Drew Olinger (guards), and Jonathan Linke (narrator); seated: Brooklyn Swenson and Abi Fry (weeping women), Michele Carda (Mary), Tayla Weber (Mary Magdelene), and Marissa Joseph, Kaylee White, Erica Howard, Taryn Ziebart, Mariah Jost and Megan Linke (weeping women).